For the transition period from_______to_______. As of May 31, 2018 (the last business day of the registrant’s most recently completed second fiscal quarter), the aggregate market value of voting stock held by non-affiliates of the registrant was approximately $1,707,000,000. As of January 17, 2019, there were 45,153,755 common shares outstanding. Certain information required in Items 10, 11, 12, 13 and 14 of Part III of this Annual Report on Form 10-K is incorporated by reference to our definitive Proxy Statement for our 2019 Annual Meeting of Stockholders to be filed pursuant to Regulation 14A (our “definitive Proxy Statement”). This Form 10-K, and other information provided by us or statements made by our directors, officers or employees from time to time, may contain statements that constitute forward-looking statements within the meaning of the Private Securities Litigation Reform Act of 1995 and other securities laws. Whenever we use words such as “believe,” “may,” “could,” “would,” “might,” “should,” “expect,” “intend,” “plan,” “estimate,” “target,” “anticipate” and negatives and derivatives of these or similar expressions, or when we make statements concerning future financial results, product offerings or other events that have not yet occurred, we are making forward-looking statements. These forward-looking statements are based upon our present intent, beliefs or expectations, but forward-looking statements are not guaranteed to occur and may not occur. Actual future results may differ materially from those contained in or implied by our forward-looking statements as a result of various factors. Such factors are more fully described in Item 1A of this Form 10-K under the heading “Risk Factors.” Although we have sought to identify the most significant risks to our business, we cannot predict whether, or to what extent, any of such risks may be realized. We also cannot assure you that we have identified all possible issues which we might face. We undertake no obligation to update any forward-looking statements that we make. Progress Software Corporation ("Progress," the "Company," "we," "us," or "our") offers the leading platform for developing and deploying strategic business applications. We enable customers and partners to deliver modern, high-impact digital experiences with a fraction of the effort, time and cost. Progress offers powerful tools for easily building adaptive user experiences across any type of device or touchpoint, award-winning machine learning that enables cognitive capabilities to be a part of any application, the flexibility of a serverless cloud to deploy modern apps, business rules, web content management, plus leading data connectivity technology. Over 1,700 independent software vendors ("ISVs"), 100,000 enterprise customers, and 2 million developers rely on Progress to power their applications. Our products are generally sold as perpetual licenses, but certain products also use term licensing models and our cloud-based offerings use a subscription based model. More than half of our worldwide license revenue is realized through relationships with indirect channel partners, principally application partners and original equipment manufacturers ("OEMs"). These ISVs develop and market applications using our technology and resell our products in conjunction with sales of their own products that incorporate our technology. We operate in North America and Latin America (the "Americas"); Europe, the Middle East and Africa ("EMEA"); and the Asia Pacific region, through local subsidiaries as well as independent distributors. Align Resources to Drive Profitability. Our organizational philosophy and operating principles focus primarily on customer and partner retention and success for our core products and a streamlined operating approach in order to more efficiently drive revenue. This strategy builds on our inherent DNA and our vast experience in application development that we’ve acquired over the past 35 years. Holistic Capital Allocation Approach. Pursuant to our capital allocation strategy, we have targeted to return approximately 75-80% of our annual cash flows from operations to stockholders in the form of share repurchases and through dividends. We have also adopted a disciplined approach to future mergers and acquisitions. By adopting strict financial criteria for future acquisitions, these acquisitions will enable us to drive significant stockholder returns by providing scale and increased cash flows. In fiscal 2018, we remained solidly on course with the execution of our strategic plan. Our budget and operating plan for 2018 reflected our focus on managing our business as efficiently as possible. Through our sustained focus on running lean operationally, we succeeded in reducing our expenses by almost $40 million over the past two years. Further, our strategy is producing tangible benefits for stockholders. The strength of our overall business enabled us to return over $145 million of capital to stockholders in fiscal 2018 in the form of share repurchases and dividends as described below. In September 2017, our Board of Directors increased our total share repurchase authorization to $250.0 million. In fiscal year 2018, we repurchased and retired 2.9 million shares of our common stock for $120.0 million. As of November 30, 2018, there was $100.0 million remaining under this current authorization. We intend to repurchase $100 million in shares of our common stock in fiscal year 2019. However, the timing and amount of any shares repurchased will be determined by management based on its evaluation of market conditions and other factors, and we may choose to suspend, expand or discontinue the repurchase program at any time. On September 21, 2018, our Board of Directors approved an 11% increase to our quarterly cash dividend from $0.14 to $0.155 per share of common stock. We began paying quarterly cash dividends of $0.125 per share of common stock to Progress stockholders in December 2016 and increased the quarterly cash dividend to $0.14 per share in September 2017. We have declared aggregate per share quarterly cash dividends totaling $0.575, $0.515 and $0.125 for the years ended November 30, 2018, November 30, 2017 and November 30, 2016, respectively. We have paid aggregate cash dividends totaling $25.8 million, and $24.1 million for the years ended November 30, 2018 and November 30, 2017, respectively. We expect to continue paying quarterly cash dividends in subsequent quarters consistent with our capital allocation strategy. However, we may terminate or modify this program at any time. During the first quarter of fiscal year 2018, the Tax Cuts and Jobs Act (the "Act") was enacted in the United States. The Act reduces the U.S. federal corporate tax rate from 35% to 21% effective January 1, 2018, requires companies to pay a one-time transition tax on earnings of certain foreign subsidiaries that were previously tax deferred, and creates new taxes on certain foreign sourced earnings. Certain international provisions of the Act, including the provisions for global intangible low-taxed income and foreign-derived intangible income, will not become effective until fiscal year 2019. Refer to Note 14 to our Consolidated Financial Statements in Item 8 of this Form 10-K for additional information. The OpenEdge business segment drives growth within OpenEdge’s large, diverse partner base by providing the technology enhancements and marketing support these partners need to sell more of their existing solutions to their customers. The OpenEdge business segment is also focused on providing partners and direct end users with a clear path to develop and integrate cloud-based applications in the future. Our professional services organization helps partners and customers leverage their core assets and develop strategies that protect current investments, while addressing changing business requirements. Progress OpenEdge is development software for building dynamic multi-language applications for secure deployment across any platform, any device, and any cloud. OpenEdge provides a unified environment comprising development tools, application servers, application management tools, an embedded relational database management system, and the capability to connect and integrate with other applications and data sources independently or with other Progress products. Progress Corticon is a market-leading Business Rules Management System that enables applications with decision automation, decision change process and decision-related insight capabilities. Corticon helps both business and IT users to quickly create or reuse business rules as well as create, improve, collaborate on, and maintain decision logic. Progress Kinvey is a modern platform for rapidly building complex enterprise applications and scalable consumer applications experiences. From mission-critical consumer and business experiences for global insurance, manufacturing and media companies, to HIPAA-compliant and life-critical apps for healthcare, health implant manufacturers and pharma. DataRPM offers an award-winning cognitive predictive maintenance solution for industrial IoT ("IIoT"). The patented platform automates predictive modeling, leveraging proprietary Meta Learning capabilities to increase quality, accuracy and timeliness of equipment failure predictions, leading to hundreds of millions of dollars in savings. The technology enables customers to predict and prevent asset failures, and increase yield and efficiencies to generate outcomes for IIoT. The Data Connectivity and Integration ("DCI") business segment is focused on the growth of our data assets, including the data integration components of our cloud offerings. Data is at the core of every application, and with the exponential growth in the number and volume of data sources, this business segment addresses the increasingly complex challenges that organizations have in accessing and integrating that data. Progress DataDirect Connect software provides data connectivity using industry-standard interfaces to connect applications running on various platforms to any major database, for both corporate IT organizations and software vendors. With software components embedded in the products of over 350 software companies and in the applications of thousands of large enterprises, the DataDirect Connect product set is a global leader in the data connectivity market. The primary products, in addition to other drivers we have developed, are ODBC drivers, JDBC drivers and ADO.NET providers. They provide the capability to connect and integrate with other applications and data sources independently or with our cloud-based offerings. Progress DataDirect Hybrid Data Pipeline is a data access service that provides simple, secure access to organizations' cloud and on-premises data sources for hybrid cloud applications, such as CRM, data management platforms or hosted analytics. It enables developers to integrate applications and data quickly, no matter whether that data lives-on-site, in the cloud or both. The Application Development and Deployment ("AD&D") business segment is focused on serving the evolving needs of our substantial developer community, and on generating net new customers for our application development assets. This business segment has the focus and agility of a start-up, able to react quickly to changes in this rapidly-evolving market in order to meet the demands of developers who are seeking to increase their productivity and move toward the cloud. DevTools is a cross-platform, user experience design, quality assurance, debugging and reporting suite for next generation web, mobile, desktop and HTML5 applications that enables developers to focus on business logic and not infrastructure. Included in DevTools are Fiddler and Kendo UI. Sitefinity is a next-generation web content management and customer analytics platform for managing and optimizing digital experiences. Sitefinity combines superior end user experience with a high level of customization capabilities for developers. Test Studio is an application lifecycle management suite for testing web, mobile and desktop applications that covers the process from idea to deployment. Most of our products have been developed by our internal product development staff or the internal staffs of acquired companies. We believe that the features and performance of our products are competitive with those of other available development and deployment tools and that none of the current versions of our products are approaching obsolescence. However, we believe that significant investments in new product development and continuing enhancements of our current products will be required for us to maintain our competitive position. As of November 30, 2018, we have four development offices in North America, two primary development offices in India and one primary development office in EMEA. We spent $79.7 million, $77.0 million, and $88.6 million in fiscal years 2018, 2017 and 2016, respectively, on product development, including capitalized software development costs. We market our products globally through several channels: directly to end users and indirectly to application partners (or ISVs), OEMs, and system integrators. Sales of our solutions and products through our direct sales force have historically been to business managers or IT managers in corporations and governmental agencies. We also target developers who create business applications, from individuals to teams, within enterprises of all sizes. We also market our products through indirect channels, primarily application partners and OEMs who embed our products as part of an integrated solution. We use international distributors in certain locations where we do not have a direct presence or where it is more economically feasible for us to do so. More than half of our license revenues are derived from indirect channels. Our application partners cover a broad range of markets, offer an extensive library of business applications and are a source of recurring revenue. We have kept entry costs, consisting primarily of the initial purchase of development licenses, low to encourage a wide variety of application partners to build applications. If an application partner succeeds in marketing its applications, we obtain recurring revenue as the application partner licenses our deployment products to allow its application to be installed and used by customers. In recent years, a significantly increasing amount of our revenue from application partners has been generated from subscriptions to application partners who have chosen to enable their business applications under a software-as-a-service ("SaaS") platform. We enter into arrangements with OEMs in which the OEM embeds our products into its solutions, typically either software or technology devices. OEMs typically license the right to embed our products into their solutions and distribute those solutions for initial terms ranging from one to three years. Historically, most of our OEMs have renewed their agreements upon the expiration of the initial term. However, there is no assurance that they will continue to renew in the future. If any of our largest OEM customers were not to renew their agreements in the future, this could materially impact our DCI segment. No single customer or partner has accounted for more than 10% of our total revenue in any of our last three fiscal years. We sell our products and solutions through our direct sales force and indirect channel partners. We have sold our products and solutions to enterprises in over 180 countries. Our sales and field marketing groups are organized primarily by region. We operate by region in the Americas, EMEA and Asia Pacific. We believe this structure allows us to maintain direct contact with our customers and support their diverse market requirements. Our international operations provide focused local sales, support and marketing efforts and are able to respond directly to changes in local conditions. In addition to our direct sales efforts, we distribute our products through systems integrators, resellers, distributors, and OEM partners in the United States and internationally. Systems integrators typically have expertise in vertical or functional markets. In some cases, they resell our products, bundling them with their broader service offerings. In other cases, they refer sales opportunities for our products to our direct sales force. Distributors sublicense our products and provide service and support within their territories. OEMs embed portions of our technology in their product offerings. Sales personnel are responsible for developing new direct end user accounts, recruiting new indirect channel partners and new independent distributors, managing existing channel partner relationships and servicing existing customers. We actively seek to avoid conflict between the sales efforts of our application partners and our own direct sales efforts. We use our inside sales team to enhance our direct sales efforts and to generate new business and follow-on business from existing customers. Our marketing personnel conduct a variety of marketing engagement programs designed to create demand for our products, enhance the market readiness of our products, raise the general awareness of our company and our products and solutions, generate leads for the sales organization and promote our various products. These programs include press relations, analyst relations, investor relations, digital/web marketing, marketing communications, participation in trade shows and industry conferences, and production of sales and marketing literature. We also hold and participate in global events, as well as regional user events in various locations throughout the world. Our sales and marketing efforts with respect to certain of our products, including DevTools, differ from our traditional sales and marketing efforts because the target markets are different. For these products, we have designed our marketing and sales model to be efficient for high volumes of lower-price transactions. Our marketing efforts focus on driving traffic to our websites and on generating high quality sales leads, in many cases, consisting of developer end users who download a free evaluation of our software. Our sales efforts then focus on converting these leads into paying customers through a high volume, short duration, sales process. Of particular importance to our target market, we enable our customers to buy our products in a manner convenient to them, whether by purchase order, online with a credit card or through our channel partners. Our customer support staff provides telephone and Web-based support to end users, application developers and OEMs. Customers may purchase maintenance services entitling them to software updates, technical support and technical bulletins. Maintenance is generally not required with our products and is purchased at the customer's option. We provide support to customers primarily through our main regional customer support centers in Bedford and Waltham, Massachusetts; Morrisville, North Carolina; Rotterdam, The Netherlands; Hyderabad, India; Melbourne, Australia; and Sofia, Bulgaria. Local technical support for specific products is provided in certain other countries as well. Our global professional services organization delivers business solutions for customers through a combination of products, consulting and education. Our consulting organization offers project management, implementation services, custom development, programming and other services. Our consulting organization also provides services to Web-enable existing applications or to take advantage of the capabilities of new product releases. Our education organization offers numerous training options, from traditional instructor-led courses to advanced learning modules available via the web or on CDs. Our services offerings include: application modernization; data management, managed database services; performance enhancements and tuning; and analytics/business intelligence. The computer software industry is intensely competitive. We experience significant competition from a variety of sources with respect to all of our products. Factors affecting competition in the markets we serve include product performance in complex applications, breadth of application solutions, vendor experience, ease of integration, price, training and support. We compete in various markets with a number of entities, such as salesforce.com, Inc., Amazon.com, Inc., Software AG, RedHat, Inc., Pivotal Software, Inc., Microsoft Corporation, Oracle Corporation and other smaller firms. Many of these vendors offer platform-as-a-service, application development, data integration and other tools in conjunction with their CRM, web services, operating systems and relational database management systems. We believe that IBM Corporation, Microsoft Corporation and Oracle Corporation currently dominate the relational database market. We do not believe that there is a dominant vendor in the other infrastructure software markets, including application development. Some of our competitors have greater financial, marketing or technical resources than we have and/or may have experience in, or be able to adapt more quickly to new or emerging technologies and changes in customer requirements or to devote greater resources to the development, promotion and sale of their products than we can. Increased competition could make it more difficult for us to maintain our revenue and market presence. We rely on a combination of contractual provisions and copyright, patent, trademark and trade secret laws to protect our proprietary rights in our products. We generally distribute our products under software license agreements that grant customers a perpetual nonexclusive license to use our products and contain terms and conditions prohibiting the unauthorized reproduction or transfer of our products. We also distribute our products through various channel partners, including application partners, OEMs and system integrators. We also license our products under term or subscription arrangements. In addition, we attempt to protect our trade secrets and other proprietary information through agreements with employees, consultants and channel partners. Although we intend to protect our rights vigorously, there is no assurance that these measures will be successful. We seek to protect the source code of our products as trade secrets and as unpublished copyrighted works. We hold numerous patents covering portions of our products. We also have several patent applications for some of our other product technologies. Where possible, we seek to obtain protection of our product names and service offerings through trademark registration and other similar procedures throughout the world. We believe that due to the rapid pace of innovation within our industry, factors such as the technological and creative skills of our personnel are as important in establishing and maintaining a leadership position within the industry as are the various legal protections of our technology. In addition, we believe that the nature of our customers, the importance of our products to them and their need for continuing product support may reduce the risk of unauthorized reproduction, although no assurances can be made in this regard. We operate and report as three distinct business segments: OpenEdge, Data Connectivity and Integration, and Application Development and Deployment. For additional information on our business segments as well as our geographical financial information, see Note 16 to our Consolidated Financial Statements in Item 8 of this Form 10-K.
As of November 30, 2018, we had 1,412 employees worldwide, including 408 in sales and marketing, 208 in customer support and services, 613 in product development and 183 in administration. None of our U.S. employees are subject to a collective bargaining agreement. Employees in certain foreign jurisdictions are represented by local workers’ councils and/or collective bargaining agreements as may be customary or required in those jurisdictions. We have experienced no work stoppages and believe our relations with employees are good. Our Annual Report on Form 10-K, Quarterly Reports on Form 10-Q, Current Reports on Form 8-K, including exhibits, and amendments to those reports filed or furnished pursuant to Sections 13(a) and 15(d) of the Securities Exchange Act of 1934, as amended, are available free of charge on our website at www.progress.com as soon as reasonably practicable after such reports are electronically filed with, or furnished to, the SEC. The information posted on our website is not incorporated into this Annual Report. Our Code of Conduct is also available on our website. Additional information about this code and amendments and waivers thereto can be found below in Part III, Item 10 of this Form 10-K.
We operate in a rapidly changing environment that involves certain risks and uncertainties, some of which are beyond our control. The risks described below are not the only risks we face. Additional risks and uncertainties not currently known to us or that we currently deem to be immaterial may also materially adversely affect our business, financial condition and/or operating results. general economic conditions in regions in which we conduct business. Revenue forecasting is uncertain, and the failure to meet our forecasts could result in a decline in our stock price. Our revenues, particularly new software license revenues, are difficult to forecast. We use a pipeline system to forecast revenues and trends in our business. Our pipeline estimates may prove to be unreliable either in a particular quarter or over a longer period of time, in part because the conversion rate of the pipeline into contracts can be difficult to estimate and requires management judgment. A variation in the conversion rate could cause us to plan or budget incorrectly and materially adversely impact our business or our planned results of operations. Furthermore, most of our expenses are relatively fixed, including costs of personnel and facilities. Thus, an unexpected reduction in our revenue, or failure to achieve the anticipated rate of growth, would have a material adverse effect on our profitability. If our operating results do not meet our publicly stated guidance or the expectations of investors, our stock price may decline. We recognize a substantial portion of our revenue from sales made through third parties, including our application partners, distributors/resellers, and OEMs, and adverse developments in the businesses of these third parties or in our relationships with them could harm our revenues and results of operations. Our future results depend in large part upon our continued successful distribution of our products through our application partner, distributor/reseller, and OEM channels. The activities of these third parties are not within our direct control. Our failure to manage our relationships with these third parties effectively could impair the success of our sales, marketing and support activities. A reduction in the sales efforts, technical capabilities or financial viability of these parties, a misalignment of interest between us and them, or a termination of our relationship with a major application partner, distributor/reseller, or OEM could have a negative effect on our sales and financial results. Any adverse effect on any of our application partners’, distributors'/resellers', or OEMs’ businesses related to competition, pricing and other factors could also have a material adverse effect on our business, financial condition and operating results. Changes in accounting principles and guidance, or their interpretation or implementation, may materially adversely affect our reported results of operations or financial position. We prepare our consolidated financial statements in accordance with accounting principles generally accepted in the United States of America (“GAAP”) These principles are subject to interpretation by the SEC and various bodies formed to create and interpret appropriate accounting principles and guidance. A change in these principles or guidance, or in their interpretations, may have a significant effect on our reported results, as well as our processes and related controls. For example, in May 2014, the Financial Accounting Standards Board (the “FASB”) issued Accounting Standards Update No. 2014-09, Revenue from Contracts with Customers (Topic 606) (“ASU 2014-09”). ASU 2014-09 outlines a single comprehensive model for entities to use in accounting for revenue arising from contracts with customers and supersedes prior revenue recognition guidance, including industry-specific guidance. This new standard is both technical and complex. The Company adopted this ASU effective December 1, 2018 and will adjust prior period consolidated financial statements to reflect full retrospective adoption, beginning with our Quarterly Report on Form 10-Q for the first quarter of 2019. Management has substantially completed assessing the impact the adoption of this standard will have on the Company’s consolidated financial statements, which will have a material impact on our consolidated financial statements, including the way we account for arrangements involving our term licenses and perpetual licenses with maintenance and/or support. In connection with the adoption of ASU 2014-09, we are implementing new processes, systems and internal controls. Such changes and any difficulties implementing such changes could materially adversely affect our reported financial results, our ability to comply with regulatory reporting requirements, and the effectiveness of our internal controls over financial reporting. For a discussion of the potential impact that the implementation of ASU 2014-09 is expected to have on our consolidated financial statements and related disclosures, see the “Recent Accounting Pronouncements” section in this Form 10-K.
A failure of our information technology systems, including the implementation of our new financial systems platform, could have a material adverse effect on our business. A failure or prolonged interruption in our information technology systems, or any difficulty encountered in upgrading our systems or implementing new systems, that compromises our ability to meet our customers’ needs, or impairs our ability to record, process and report accurate information could have a material adverse effect on our financial condition. We are in the process of implementing a new financial systems platform which will assist with the collection, storage, management and interpretation of data from our business activities to support future growth and to integrate significant processes. Our financial systems platform is critical to our ability to accurately maintain books and records, record transactions, provide important information to our management and prepare our consolidated financial statements. Financial systems platform implementations are complex and time-consuming and involve significant expenditures on system software and implementation activities, as well as changes in business processes. As part of the implementation of our new financial systems platform, certain changes to our processes and procedures have and will continue to occur. These changes will result in changes to our internal control over financial reporting. This new platform is designed to strengthen our internal financial controls by automating certain manual processes and standardizing business processes and reporting across our organization. However, any disruptions, delays or deficiencies in the design and implementation of a new financial systems platform could adversely affect our ability to operate our business. Additionally, if the new platform does not operate as intended, the effectiveness of our internal control over financial reporting could be adversely affected or our ability to assess it adequately could be further impacted. Weakness in the U.S. and international economies may result in fewer sales of our products and may otherwise harm our business. We are subject to risks arising from adverse changes in global economic conditions, especially those in the U.S., Europe and Latin America. If global economic conditions weaken, credit markets tighten and/or financial markets become unstable, customers may delay, reduce or forego technology purchases, both directly and through our application partners and OEMs. This could result in reductions in sales of our products, longer sales cycles, slower adoption of new technologies and increased price competition. Further, deteriorating economic conditions could adversely affect our customers and their ability to pay amounts owed to us. Any of these events would likely harm our business, results of operations, financial condition or cash flows. Our international operations expose us to additional risks, and changes in global economic and political conditions could adversely affect our international operations, our revenue and our net income. Approximately 45% of our total revenue is generated from sales outside North America. Political and/or financial instability, oil price shocks and armed conflict in various regions of the world can lead to economic uncertainty and may adversely impact our business. For example, the announcement of the Referendum of the United Kingdom’s (the "U.K.") Membership of the European Union ("E.U.") (referred to as "Brexit"), advising for the exit of the U.K. from the E.U., resulted in significant volatility in global stock markets and currency exchange rate fluctuations. If customers’ buying patterns, decision-making processes, timing of expected deliveries and timing of new projects unfavorably change due to economic or political conditions, there would be a material adverse effect on our business, financial condition and operating results. Any one or more of these factors could have a material adverse effect on our international operations, and, consequently, on our business, financial condition and operating results. Fluctuations in foreign currency exchange rates could have an adverse impact on our financial condition and results of operations. Changes in the value of foreign currencies relative to the U.S. dollar could adversely affect our results of operations and financial position. For example, during periods in which the value of the U.S. dollar strengthens in comparison to certain foreign currencies, particularly in Europe, Brazil and Australia, our reported international revenue is reduced because foreign currencies translate into fewer U.S. dollars. As approximately one-third of our revenue is denominated in foreign currencies, our revenue results have been impacted, and we expect will continue to be impacted, by fluctuations in foreign currency exchange rates. We seek to reduce our exposure to fluctuations in exchange rates by entering into foreign exchange forward contracts to hedge certain actual and forecasted transactions of selected currencies (mainly in Europe, Brazil, India and Australia). Our currency hedging transactions may not be effective in reducing any adverse impact of fluctuations in foreign currency exchange rates. Further, the imposition of exchange or price controls or other restrictions on the conversion of foreign currencies could have a material adverse effect on our business. Technology and customer requirements evolve rapidly in our industry, and if we do not continue to develop new products and enhance our existing products in response to these changes, our business could be harmed. Ongoing enhancements to our product sets will be required to enable us to maintain our competitive position and the competitive position of our application partners, distributors/resellers, and OEMs. We may not be successful in developing and marketing enhancements to our products on a timely basis, and any enhancements we develop may not adequately address the changing needs of the marketplace. Overlaying the risks associated with our existing products and enhancements are ongoing technological developments and rapid changes in customer and partner requirements. Our future success will depend upon our ability to develop and introduce in a timely manner new products that take advantage of technological advances and respond to new customer and partner requirements. We may not be successful in developing new products incorporating new technology on a timely basis, and any new products we develop may not adequately address the changing needs of the marketplace or may not be accepted by the market. Failure to develop new products and product enhancements that meet market needs in a timely manner could have a material adverse effect on our business, financial condition and operating results. We are substantially dependent on our Progress OpenEdge products. We derive a significant portion of our revenue from software license and maintenance revenue attributable to our Progress OpenEdge product set. Accordingly, our future results depend on continued market acceptance of OpenEdge. If new technologies emerge that are superior to, or are more responsive to customer requirements than, OpenEdge such that we are unable to maintain OpenEdge’s competitive position within its marketplace, our business, financial condition and operating results may be materially adversely affected. We have made significant investments in furtherance of our cognitive applications strategy and these investments may not generate the revenues we expect, which could adversely affect our business and financial results. Our cognitive applications strategy is focused on providing the platform and tools enterprises need to build next generation applications that drive their businesses, known as “cognitive applications.” Beginning in 2017, we have made significant investments in furtherance of our cognitive applications strategy, including two acquisitions. We cannot guarantee that our cognitive applications strategy is the right one or that we will be effective in executing this strategy. Our strategy may not succeed for a number of reasons, including, but not limited to: general economic risks, execution risks with acquisitions, competitiveness in and the dynamic nature of the markets in which we operate, execution risks around product development, market acceptance of new products and services and risks associated with the adoption of, and demand for, our model in general. If one or more of the foregoing risks were to materialize, our business, results of operations and ability to achieve sustained profitability could be adversely affected. we may incur costs at a higher than forecasted rate as we enhance and expand our cloud operations. We may make additional acquisitions or investments in new businesses, products or technologies that involve additional risks, which could disrupt our business or harm our financial condition, results of operations or cash flows. We may make acquisitions of businesses or investments in companies that offer complementary products, services and technologies. Any acquisitions that we do complete involve a number of risks, including the risks of assimilating the operations and personnel of acquired companies, realizing the value of the acquired assets relative to the price paid, distraction of management from our ongoing businesses and potential product disruptions associated with the sale of the acquired company’s products. In addition, an acquisition may not further our business strategy as we expected, may not result in revenue growth to the degree we expected or at all or may not achieve expected synergies, any of which could adversely affect our business or operating results and potentially cause impairment to assets that we recorded as a part of an acquisition including intangible assets and goodwill. These factors could have a material adverse effect on our business, financial condition, operating results and cash flows. The consideration we pay for any future acquisitions could include our stock. As a result, future acquisitions could cause dilution to existing stockholders and to earnings per share. The segments of the software industry in which we participate are intensely competitive, and our inability to compete effectively could harm our business. We experience significant competition from a variety of sources with respect to the marketing and distribution of our products. Many of our competitors have greater financial, marketing or technical resources than we do and may be able to adapt more quickly to new or emerging technologies and changes in customer requirements or to devote greater resources to the promotion and sale of their products than we can. Increased competition could make it more difficult for us to maintain our market presence or lead to downward pricing pressure. In addition, the marketplace for new products is intensely competitive and characterized by low barriers to entry. For example, an increase in market acceptance of open source software may cause downward pricing pressures. As a result, new competitors possessing technological, marketing or other competitive advantages may emerge and rapidly acquire market share. In addition, current and potential competitors may make strategic acquisitions or establish cooperative relationships among themselves or with third parties, thereby increasing their ability to deliver products that better address the needs of our prospective customers. Current and potential competitors may also be more successful than we are in having their products or technologies widely accepted. We may be unable to compete successfully against current and future competitors, and our failure to do so could have a material adverse effect on our business, prospects, financial condition and operating results. We rely on the experience and expertise of our skilled employees, and must continue to attract and retain qualified technical, marketing and managerial personnel in order to succeed. Our future success will depend in a large part upon our ability to attract and retain highly skilled technical, managerial, sales and marketing personnel. There is significant competition for such personnel in the software industry. We may not continue to be successful in attracting and retaining the personnel we require to develop new and enhanced products and to continue to grow and operate profitably. Our periodic workforce restructurings can be disruptive. We have in the past restructured or made other adjustments to our workforce in response to management changes, product changes, performance issues, changes in strategy, acquisitions and other internal and external considerations. In the past, these restructurings have resulted in increased restructuring costs and have temporarily reduced productivity. These effects could recur in connection with any future restructurings or we may not achieve or sustain the expected growth or cost savings benefits of any such restructurings, or do so within the expected timeframe. As a result, our revenues and other results of operations could be negatively affected. The loss of technology licensed from third parties could adversely affect our ability to deliver our products. We utilize certain technology that we license from third parties, including software that is integrated with internally developed software and used in our products to perform key functions. This technology, or functionally similar technology, may not continue to be available on commercially reasonable terms in the future, or at all. The loss of any significant third-party technology license could cause delays in our ability to deliver our products or services until equivalent technology is developed internally or equivalent third-party technology, if available, is identified, licensed and integrated. Our business practices with respect to the collection, use and management of personal information could give rise to operational interruption, liabilities or reputational harm as a result of governmental regulation, legal requirements or industry standards relating to consumer privacy and data protection. As regulatory focus on privacy issues continues to increase and worldwide laws and regulations concerning the handling of personal information expand and become more complex, potential risks related to data collection and use within our business will intensify. For example, the E.U. and the United States ("U.S.") formally entered into a new framework in July 2016 that provides a mechanism for companies to transfer data from E.U. member states to the U.S. This new framework, called the Privacy Shield, is intended to address shortcomings identified by the Court of Justice of the E.U. in the previous E.U.-U.S. Safe Harbor Framework, which the Court of Justice invalidated in October 2015. The Privacy Shield and other data transfer mechanisms are likely to be reviewed by the European courts, which may lead to uncertainty about the legal basis for data transfers to the U.S. or interruption of such transfers. In the event any court blocks transfers to or from a particular jurisdiction on the basis that no transfer mechanisms are legally adequate, this could give rise to operational interruption in the performance of services for customers and internal processing of employee information, regulatory liabilities or reputational harm. In addition, U.S. and foreign governments have enacted or are considering enacting legislation or regulations, or may in the near future interpret existing legislation or regulations, in a manner that could significantly impact our ability and the ability of our customers and data partners to collect, augment, analyze, use, transfer and share personal and other information that is integral to certain services we provide. Regulators globally are also imposing greater monetary fines for privacy violations. For example, in 2016, the E.U. adopted a new law governing data practices and privacy called the General Data Protection Regulation (GDPR), which became effective in May 2018. The law establishes new requirements regarding the handling of personal data. Non-compliance with the GDPR may result in monetary penalties of up to 4% of worldwide revenue. The GDPR and other changes in laws or regulations associated with the enhanced protection of certain types of sensitive data, such as healthcare data or other personal information, could greatly increase our cost of providing our products and services or even prevent us from offering certain services in jurisdictions that we operate. Additionally, public perception and standards related to the privacy of personal information can shift rapidly, in ways that may affect our reputation or influence regulators to enact regulations and laws that may limit our ability to provide certain products. Any failure, or perceived failure, by us to comply with U.S. federal, state, or foreign laws and regulations, including laws and regulations regulating privacy, data security, or consumer protection, or other policies, public perception, standards, self-regulatory requirements or legal obligations, could result in lost or restricted business, proceedings, actions or fines brought against us or levied by governmental entities or others, or could adversely affect our business and harm our reputation. litigation. If we experience errors or delays in releasing new products or new versions of products, such errors or delays could have a material adverse effect on our revenue. We could incur substantial cost in protecting our proprietary software technology or if we fail to protect our technology, which would harm our business. We rely principally on a combination of contract provisions and copyright, trademark, patent and trade secret laws to protect our proprietary technology. Despite our efforts to protect our proprietary rights, unauthorized parties may attempt to copy aspects of our products or to obtain and use information that we regard as proprietary. Policing unauthorized use of our products is difficult. Litigation may be necessary in the future to enforce our intellectual property rights, to protect our trade secrets or to determine the validity and scope of the proprietary rights of others. This litigation could result in substantial costs and diversion of resources, whether or not we ultimately prevail on the merits. The steps we take to protect our proprietary rights may be inadequate to prevent misappropriation of our technology; moreover, others could independently develop similar technology. We could be subject to claims that we infringe intellectual property rights of others, which could harm our business, financial condition, results of operations or cash flows. Third parties could assert infringement claims in the future with respect to our products and technology, and such claims might be successful. Litigation relating to any such claims could result in substantial costs and diversion of resources, whether or not we ultimately prevail on the merits. Any such litigation could also result in our being prohibited from selling one or more of our products, unanticipated royalty payments, reluctance by potential customers to purchase our products, or liability to our customers and could have a material adverse effect on our business, financial condition, operating results and cash flows. If our security measures are breached, our products and services may be perceived as not being secure, customers may curtail or stop using our products and services, and we may incur significant legal and financial exposure. Our products and services involve the storage and transmission of our customers’ proprietary information and may be vulnerable to unauthorized access, computer viruses, cyber-attacks, distributed denial of service attacks and other disruptive problems Due to the actions of outside parties, employee error, malfeasance, or otherwise, an unauthorized party may obtain access to our data or our customers’ data, which could result in its theft, destruction or misappropriation. Security risks in recent years have increased significantly given the increased sophistication and activities of hackers, organized crime, including state-sponsored organizations and nation-states, and other outside parties. Cyber threats are continuously evolving, increasing the difficulty of defending against them. While we have implemented security procedures and controls to address these threats, our security measures could be compromised or could fail. Any security breach or unauthorized access could result in significant legal and financial exposure, increased costs to defend litigation, indemnity and other contractual obligations, government fines and penalties, damage to our reputation and our brand, and a loss of confidence in the security of our products and services that could potentially have an adverse effect on our business and results of operations. Breaches of our network could disrupt our internal systems and business applications, including services provided to our customers. Additionally, data breaches could compromise technical and proprietary information, harming our competitive position. We may need to spend significant capital or allocate significant resources to ensure effective ongoing protection against the threat of security breaches or to address security related concerns. If an actual or perceived breach of our security occurs, the market perception of the effectiveness of our security measures could be harmed and we could lose customers. In addition, our insurance coverage may not be adequate to cover all costs related to cybersecurity incidents and the disruptions resulting from such events. We may have exposure to additional tax liabilities. As a multinational corporation, we are subject to income taxes in the U.S. and various foreign jurisdictions. Significant judgment is required in determining our global provision for income taxes and other tax liabilities. In the ordinary course of a global business, there are many intercompany transactions and calculations where the ultimate tax determination is uncertain. Our income tax returns are routinely subject to audits by tax authorities. Although we regularly assess the likelihood of adverse outcomes resulting from these examinations to determine our tax estimates, a final determination of tax audits that is inconsistent with such assessments or tax disputes could have an adverse effect on our financial condition, results of operations and cash flows. We are also subject to non-income taxes, such as payroll, sales, use, value-added, net worth, property and goods and services taxes in the U.S. and various foreign jurisdictions. We are regularly under audit by tax authorities with respect to these non-income taxes and may have exposure to additional non-income tax liabilities, which could have an adverse effect on our results of operations, financial condition and cash flows. In addition, our future effective tax rates could be favorably or unfavorably affected by changes in tax rates, changes in the valuation of our deferred tax assets or liabilities, or changes in tax laws or their interpretation. Such changes could have a material adverse impact on our financial results. We are required to comply with certain financial and operating covenants under our credit facility and to make scheduled debt payments as they become due; any failure to comply with those covenants or to make scheduled payments could cause amounts borrowed under the facility to become immediately due and payable or prevent us from borrowing under the facility. In November 2017, we entered into an amended and restated credit agreement, which consists of a $123.8 million term loan and a $150.0 million revolving loan (which may be increased by an additional $125.0 million if the existing or additional lenders are willing to make such increased commitments). This facility matures in November 2022, at which time any amounts outstanding will be due and payable in full. We may wish to borrow additional amounts under the facility in the future to support our operations, including for strategic acquisitions and share repurchases. We are required to comply with specified financial and operating covenants and to make scheduled repayments of our term loan, which may limit our ability to operate our business as we otherwise might operate it. Our failure to comply with any of these covenants or to meet any payment obligations under the facility could result in an event of default which, if not cured or waived, would result in any amounts outstanding, including any accrued interest and unpaid fees, becoming immediately due and payable. We might not have sufficient working capital or liquidity to satisfy any repayment obligations in the event of an acceleration of those obligations. In addition, if we are not in compliance with the financial and operating covenants at the time we wish to borrow funds, we will be unable to borrow funds. Our annual operating cash flows may not be sufficient to enable us to meet our targeted capital allocation policy, which could decrease our investors expected return on investment in Progress stock. In September 2017, we announced a new capital allocation strategy in which we are targeting to return approximately 75-80% of annual cash flows from operations to stockholders through share repurchases and through dividends. Meeting these targets requires us to generate consistent cash flow and have available capital in an amount sufficient to enable us to continue investing in our business. We may not meet these targets if we do not generate the operating cash flows we expect, if we use our available cash to satisfy other priorities, if we have insufficient funds available to make such repurchases and/or dividends or if we are unable to borrow funds under our credit facility. Our common stock price may continue to be volatile, which could result in losses for investors. The market price of our common stock, like that of other technology companies, is volatile and is subject to wide fluctuations in response to quarterly variations in operating results, announcements of technological innovations or new products by us or our competitors, changes in financial estimates by securities analysts or other events or factors. Our stock price may also be affected by broader market trends unrelated to our performance. As a result, purchasers of our common stock may be unable at any given time to sell their shares at or above the price they paid for them. As of the date of this report, we do not have any open comments from the SEC related to our financial statements or periodic filings with the SEC. We own our principal administrative, sales, support, marketing, product development and distribution facilities, which are located in three buildings totaling approximately 258,000 square feet in Bedford, Massachusetts. As of November 30, 2018, we reclassified two of these buildings from property and equipment to assets held for sale. For further discussion, refer to Note 5 to our Consolidated Financial Statements in Item 8 of this Form 10-K.
We also maintain offices in leased facilities in various other locations in North America and outside North America, including Australia, Bulgaria, Germany, India, Netherlands, and the U.K. The terms of our leases generally range from one to seven years. We believe that our facilities are adequate for our current needs and that suitable additional space will be available as needed. We are subject to various legal proceedings and claims, either asserted or unasserted, which arise in the ordinary course of business. While the outcome of these claims cannot be predicted with certainty, management does not believe that the outcome of any of these legal matters will have a material effect on our consolidated financial position, results of operations or cash flows. The following table sets forth, for the periods indicated, the range of high and low sale prices for our common stock. 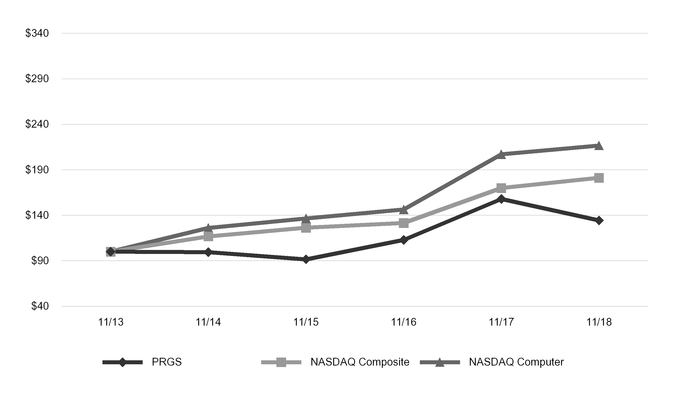 Our common stock trades on the NASDAQ Global Select Market under the symbol "PRGS". On September 21, 2018, our Board of Directors approved an 11% increase to our quarterly cash dividend from $0.14 to $0.155 per share of common stock. We began paying quarterly cash dividends of $0.125 per share of common stock to Progress stockholders in December 2016 and increased the quarterly cash dividend to $0.14 per share in September 2017. On January 8, 2019, our Board of Directors declared a quarterly dividend of $0.155 per share of common stock that will be paid on March 15, 2019 to stockholders of record as of the close of business on March 1, 2019. As of December 31, 2018, our common stock was held by approximately 158 stockholders of record. In September 2017, our Board of Directors increased our total share repurchase authorization to $250.0 million. In fiscal years 2018 and 2017, we repurchased and retired 2.9 million shares of our common stock for $120.0 million and 2.2 million shares of our common stock for $73.9 million, respectively. As of November 30, 2018, there was $100.0 million remaining under this current authorization. In September 2017, our Board of Directors increased our total share repurchase authorization to $250.0 million. As of November 30, 2018, there was $100.0 million remaining under this authorization, which expires at the end of fiscal year 2019. The graph below compares the cumulative total stockholder return on our common stock with the cumulative total return on the NASDAQ Composite Index and the NASDAQ Computer Index for each of the last five fiscal years ended November 30, 2018, assuming an investment of $100 at the beginning of such period and the reinvestment of any dividends. (1) $100 invested on November 30, 2013 in stock or index, including reinvestment of dividends. Fiscal year 2016 amounts have been impacted by a $92.0 million impairment charge related to the goodwill of the Application Development and Deployment reporting unit. Refer to Note 6 to our Consolidated Financial Statements in Item 8 of this Form 10-K for additional details. Certain statements below about anticipated results and our products and markets are forward-looking statements that are based on our current plans and assumptions. Important information about the bases for these plans and assumptions and factors that may cause our actual results to differ materially from these statements is contained below and in Item 1A. “Risk Factors” of this Annual Report on Form 10-K.
As exchange rates are an important factor in understanding period to period comparisons, we believe the presentation of revenue growth rates on a constant currency basis enhances the understanding of our revenue results and evaluation of our performance in comparison to prior periods. The constant currency information presented is calculated by translating current period results using prior period weighted average foreign currency exchange rates. These results should be considered in addition to, not as a substitute for, results reported in accordance with GAAP. Progress Software Corporation ("Progress," the "Company," "we," "us," or "our") offers the leading platform for developing and deploying strategic business applications. We enable customers and partners to deliver modern, high-impact digital experiences with a fraction of the effort, time and cost. Progress offers powerful tools for easily building adaptive user experiences across any type of device or touchpoint, award-winning machine learning that enables cognitive capabilities to be a part of any application, the flexibility of a serverless cloud to deploy modern apps, business rules, web content management, plus leading data connectivity technology. Over 1,700 ISVs, 100,000 enterprise customers, and 2 million developers rely on Progress to power their applications. We operate as three distinct segments: OpenEdge, Data Connectivity and Integration, and Application Development and Deployment. On March 1, 2017, we acquired DataRPM for an aggregate sum of $30.0 million. DataRPM is a leader in cognitive predictive maintenance for the industrial IoT ("IIoT") market. This acquisition is a key part of the Company's strategy to provide the best platform to build and deliver cognitive applications. On June 1, 2017, we acquired Kinvey for an aggregate sum of $49.2 million. Kinvey allows developers to set up, use, and operate a cloud backend for any native, hybrid, web, or IoT app built using any development tools. This acquisition, in combination with our existing technologies, enables us to offer the premier, high productivity platform for building and delivering cognitive applications. We expect to continue to evaluate possible acquisitions and other strategic transactions designed to expand our business. As a result, our expected uses of cash could change, our cash position could be reduced and we may incur additional debt obligations to the extent we complete additional acquisitions. However, we believe that existing cash balances, together with funds generated from operations and amounts available under our credit facility, will be sufficient to finance our operations and meet our foreseeable cash requirements, including quarterly cash dividends and stock repurchases to Progress stockholders, through at least the next twelve months. We derive a significant portion of our revenue from international operations, which are primarily conducted in foreign currencies. As a result, changes in the value of these foreign currencies relative to the U.S. dollar have significantly impacted our results of operations and may impact our future results of operations. For example, in fiscal year 2016, the value of the U.S. dollar strengthened in comparison to certain foreign currencies, including in Europe, Brazil and Australia. Since approximately one-third of our revenue is denominated in foreign currency, our revenue results during those periods were negatively impacted. The impact of foreign exchange did not result in a material impact on revenue during fiscal years 2018 or 2017. We expect that future fluctuations in foreign currency exchange rates will impact our results. $100.0 million remaining under this current authorization. We intend to repurchase $100 million in shares of our common stock in fiscal year 2019. However, the timing and amount of any shares repurchased will be determined by management based on its evaluation of market conditions and other factors, and we may choose to suspend, expand or discontinue the repurchase program at any time. On September 21, 2018, our Board of Directors approved an 11% increase to our quarterly cash dividend from $0.14 to $0.155 per share of common stock. We began paying quarterly cash dividends of $0.125 per share of common stock to Progress stockholders in December 2016 and increased the quarterly cash dividend to $0.14 per share in September 2017. We expect to continue paying quarterly cash dividends in subsequent quarters consistent with our capital allocation strategy. However, we may terminate or modify this program at any time. On January 8, 2019, our Board of Directors declared a quarterly dividend of $0.155 per share of common stock that will be paid on March 15, 2019 to stockholders of record as of the close of business on March 1, 2019. On December 22, 2017, the Tax Cuts and Jobs Act (the "Act") was signed into law. The Act will impact the Company’s operating results, cash flows, and financial condition beginning in the fiscal year ended November 30, 2018 and the Company has evaluated the extent of the impact. The Act includes a number of provisions, including the reduction of the U.S. corporate tax rate from 35% to 21%, effective January 1, 2018. The Act also includes provisions that may partially offset the benefit of such rate reduction, including the repeal of the deduction for domestic production activities. As a result of the Act, we realized a one-time tax benefit of $1.7 million for the remeasurement of deferred tax assets and liabilities. The Act also provided for a one-time deemed mandatory repatriation of post-1986 undistributed foreign subsidiary earnings and profits through December 31, 2017. However, the Company will not incur one-time transition tax due to the Company’s foreign subsidiaries being in a net accumulated deficit position. Other international provisions of the Act, including the provisions for global intangible low-taxed income and foreign-derived intangible income, will not become effective for the Company until fiscal 2019. Total revenue decreased slightly in fiscal year 2018 as compared to fiscal year 2017 primarily due to a decline in license and professional services revenue, partially offset by an increase in maintenance revenue and a favorable impact from foreign currency exchange rates as further described below. Changes in prices from fiscal year 2017 to 2018 did not have a significant impact on our revenue. Software license revenue decreased in fiscal year 2018 as compared to fiscal year 2017 due to a decrease in software license revenue in our Data Connectivity and Integration and Application Development and Deployment segments. Maintenance revenue increased in fiscal year 2018 as compared fiscal year 2017 due to a favorable impact from currency exchange rates and an increase in maintenance revenue in our Application Development and Deployment segment, partially offset by a decline in our Data Connectivity and Integration segment. Professional services revenue decreased in fiscal year 2018 as compared to fiscal year 2017 primarily due to lower professional services revenue from our OpenEdge and Application Development and Deployment segments. Total revenue generated in North America decreased $4.0 million, and total revenue generated outside North America increased $3.6 million, in fiscal year 2018 as compared to fiscal year 2017. The decrease in North America was primarily due to a decrease in license revenue in our Data Connectivity and Integration and Application Development and Deployment segments and professional services revenue in our OpenEdge segment. This decrease was partially offset by an increase in maintenance revenue in our OpenEdge segment. The increase in revenue generated in EMEA in fiscal year 2018 as compared to fiscal year 2017 was primarily due to a favorable impact from currency exchange rates as well as an increase in OpenEdge professional services revenue and Application Development and Deployment maintenance revenue. Revenue generated in Latin America decreased in fiscal year 2018 as compared to fiscal year 2017 due to a negative impact of exchange rate fluctuations. The revenue generated in Asia Pacific decreased in fiscal year 2018 as compared to fiscal year 2017 primarily due to lower professional services revenue in our Application Development and Deployment segment. Total revenue generated in markets outside North America represented 45% of total revenue in fiscal year 2018 compared to 44% of total revenue in the same period last year. If exchange rates had remained constant in fiscal year 2018 as compared to the exchange rates in effect in fiscal year 2017, total revenue generated in markets outside North America would have been 44% of total revenue. Revenue in the OpenEdge segment increased in fiscal year 2018 as compared to fiscal year 2017, largely due to the favorable impact of exchange rate fluctuations, partially offset by a decrease in professional services revenue. Data Connectivity and Integration segment revenue decreased in fiscal year 2018 as compared to fiscal year 2017 primarily due to the timing of certain renewals by original equipment manufacturers ("OEMs"). Application Development and Deployment segment revenue decreased in fiscal year 2018 as compared to fiscal year 2017, primarily due to lower license and professional services revenue, partially offset by an increase in maintenance revenue. Cost of software licenses consists primarily of costs of royalties, electronic software distribution, duplication, and packaging. Cost of software licenses as a percentage of software license revenue varies from period to period depending upon the relative product mix. The decrease in cost of software licenses in fiscal year 2018 was a result of lower payments of royalties to third parties as compared to fiscal year 2017. Cost of maintenance and services consists primarily of costs of providing customer support, consulting, and education. Cost of maintenance and services decreased in fiscal year 2018 as compared to fiscal year 2017 primarily due to lower compensation-related costs resulting from a decrease in headcount, partially offset by higher third-party professional services expense. Amortization of acquired intangibles included in costs of revenue primarily represents the amortization of the value assigned to technology-related intangible assets obtained in business combinations. Amortization of acquired intangibles increased in fiscal year 2018 as compared to fiscal year 2017. The increase was primarily due to the addition of intangible assets associated with the technologies obtained in connection with the acquisitions of DataRPM in the second quarter of fiscal year 2017 and Kinvey in the third quarter of fiscal year 2017, partially offset by the completion of amortization of certain intangible assets acquired in prior years. Our gross profit increased in fiscal year 2018 as compared to fiscal year 2017 primarily due to an increase in maintenance revenue and the decrease in cost of maintenance and services and cost of software licenses as described above, offset slightly by the increase of amortization of acquired intangibles and the decrease in software license and professional services revenue. Sales and marketing expenses decreased in fiscal year 2018 as compared to fiscal year 2017 primarily due to lower compensation-related and professional service expenses as a result of the headcount reduction actions which occurred in the first quarter of fiscal year 2017. The decrease was partially offset by higher marketing programs costs related to the go-to-market efforts for Kinvey and DataRPM. Product development expenses increased in fiscal year 2018 as compared to fiscal year 2017 primarily due to higher stock-based compensation expenses, partially offset by lower compensation-related costs. During the first quarter of fiscal year 2017, there were significant forfeitures due to our restructuring action, which significantly reduced stock-based compensation expense in fiscal year 2017 as compared to fiscal year 2018. General and administrative expenses include the costs of our finance, human resources, legal, information systems and administrative departments. General and administrative expenses increased in fiscal year 2018 as compared to fiscal year 2017 primarily due to increased stock-based compensation expense, as well as higher professional services expense, partially offset by lower compensation-related expenses. During the first quarter of fiscal year 2017, there were significant forfeitures due to our restructuring action, which significantly reduced stock-based compensation expense in fiscal year 2017 as compared to fiscal year 2018. Amortization of acquired intangibles included in operating expenses primarily represents the amortization of value assigned to intangible assets obtained in business combinations other than assets identified as purchased technology. Amortization of acquired intangibles increased in fiscal year 2018 as compared to fiscal year 2017 due to the addition of intangible assets obtained in connection with the acquisitions of DataRPM and Kinvey, which occurred in the second and third quarters of fiscal year 2017, respectively. In the fourth quarter of fiscal year 2018, we reclassified certain corporate land and building assets previously reported as property and equipment to assets held for sale on our consolidated balance sheets as we are actively marketing them and expect to sell them within one year. As a result, we recognized an impairment charge of $5.1 million, which represents the difference between the fair value less cost to sell and the carrying value of the assets. The impairment charge was recorded to loss on assets held for sale within operating expenses on our fiscal year 2018 consolidated statement of operations. See Note 5 to our Consolidated Financial Statements in Item 8 of this Form 10-K for additional details. In September 2017, Praesidium Investment Management, then one of our largest stockholders, publicly announced its disagreement with our strategy in a Schedule 13D filed with the SEC and stated that it was seeking changes in the composition of our Board of Directors. In fiscal years 2017 and 2018, we incurred professional and other fees relating to Praesidium’s actions. Restructuring expenses recorded in fiscal year 2018 relate to the restructuring activities that occurred in fiscal year 2017. See Note 13 to our Consolidated Financial Statements in Item 8 of this Form 10-K for additional details, including types of expenses incurred and the timing of future expenses and cash payments. See also the Liquidity and Capital Resources section of this Item 2, Management’s Discussion and Analysis of Financial Condition and Results of Operations. Acquisition-related costs are expensed as incurred and include those costs incurred as a result of a business combination. These costs consist of professional services fees, including third-party legal and valuation-related fees, as well as retention fees, and earn-out payments treated as compensation expense. Acquisition-related expenses in fiscal year 2018 were minimal. Acquisition-related expenses in fiscal year 2017 resulted primarily from expense related to the acquisitions of DataRPM and Kinvey, which occurred in the second and third quarters of fiscal year 2017, respectively. Income from operations increased in fiscal year 2018 as compared to fiscal year 2017. As described above, the increase was primarily driven by lower restructuring expenses, sales and marketing expenses, and acquisition expenses as well as higher gross margin. This increase was partially offset by the loss on assets held for sale recorded in fiscal year 2018, higher general and administrative expenses and higher product development expenses as described above. Note that the following expenses are not allocated to our segments as we manage and report our business in these functional areas on a consolidated basis only: certain product development and corporate sales and marketing expenses, customer support, administration, amortization of acquired intangibles, loss on assets held for sale, stock-based compensation, fees related to shareholder activist, restructuring, and acquisition-related expenses. Other (expense) income, net decreased in fiscal year 2018 as compared to fiscal year 2017 primarily due to an increase in foreign currency losses and higher interest expense. The increase in foreign currency losses is a result of an increase in the cost of forward points relating to our hedging activities, as well as movements in exchange rates and changes in our intercompany receivables and payables denominated in currencies other than local currencies during fiscal year 2018. Our effective income tax rate was 20% in fiscal year 2018 and 43% in fiscal year 2017. The primary reason for the decrease in the effective rate was due to enactment of tax reform in the United States that lowered our federal tax rate in fiscal year 2018 to a blended rate of 22.2% as compared to 35.0% in fiscal year 2017. In addition, during fiscal year 2018 we recorded a $1.7 million income tax benefit for the re-measurement of our U.S. deferred tax balances. Total revenue decreased $7.8 million, or 2%, in fiscal year 2017 as compared to fiscal year 2016. Revenue would have decreased by the same percentage if exchange rates had been constant in fiscal year 2017 as compared to exchange rates in fiscal year 2016. Changes in prices from fiscal year 2016 to 2017 did not have a significant impact on our revenue. Software license revenue decreased $10.5 million, or 8%, in fiscal year 2017 as compared to fiscal year 2016. Software license revenue would have decreased by the same percentage if exchange rates had been constant in fiscal year 2017 as compared to exchange rates in effect in fiscal year 2016. The decrease in license revenue is primarily due to decreases in license revenue in North America from products included in our Data Connectivity and Integration segment, due to the timing of certain OEM renewal agreements. Maintenance and services revenue increased $2.7 million in fiscal year 2017 as compared to fiscal year 2016. Maintenance revenue increased 1% and professional services revenue decreased 1% compared to the prior year. The increase in maintenance revenue is primarily due to higher maintenance revenue from our DevTools and Sitefinity products included in our Application Development and Deployment segment. The decrease in services revenue is primarily due to lower revenue from our OpenEdge segment partially offset by higher professional services revenue generated by our Application Development and Deployment segment. Total revenue generated in North America decreased $5.3 million, and total revenue generated outside North America decreased $2.5 million, in fiscal year 2017 as compared to fiscal year 2016. The decrease in North America was primarily due to license revenue decreases in our Data Connectivity and Integration segment. The decrease in Asia Pacific is primarily due to maintenance revenue decreases in our OpenEdge segment related to a single, large customer not renewing maintenance, and also related to a large deal in our Data Connectivity and Integration segment with a customer in Japan that occurred in the second quarter of fiscal year 2016. Total revenue generated in markets outside North America represented 44% of total revenue in fiscal year 2017 compared to 43% of total revenue in fiscal year 2016. If exchange rates had remained constant in fiscal year 2017 as compared to the exchange rates in effect in fiscal year 2016, total revenue generated in markets outside North America would have remained at 44% of total revenue. Revenue in the OpenEdge segment remained flat in fiscal year 2017 as compared to fiscal year 2016, primarily due to higher license sales and software-as-a-service revenue offset by decreases in maintenance and services revenue. Revenue in the OpenEdge segment would have remained flat if exchange rates had been constant in fiscal year 2017 as compared to exchange rates in fiscal year 2016. Data Connectivity and Integration revenue decreased $7.1 million, or 15%, in fiscal year 2017 as compared to fiscal year 2016, primarily due to the timing of certain OEM renewals. Application Development and Deployment revenue decreased $0.6 million, or 1%, year over year primarily as a result of a decrease in license revenue, offset by higher maintenance revenue from our DevTools and Sitefinity products. Cost of software licenses consists primarily of costs of royalties, electronic software distribution costs, duplication and packaging. Cost of software licenses increased $0.3 million, or 5%, in fiscal year 2017 as compared to fiscal year 2016, and increased as a percentage of software license revenue from 4% to 5%. Cost of software licenses as a percentage of software license revenue varies from period to period depending upon the relative product mix. Cost of maintenance and services consists primarily of costs of providing customer support, consulting and education. Cost of maintenance and services decreased $1.5 million, or 3%, in fiscal year 2017 as compared to fiscal year 2016, and decreased as a percentage of maintenance and services revenue from 17% to 16%. The decrease in cost of maintenance and services is primarily due to lower compensation-related costs resulting from a decrease in headcount. Amortization of acquired intangibles included in costs of revenue primarily represents the amortization of the value assigned to technology-related intangible assets obtained in business combinations. Amortization of acquired intangibles increased $4.6 million, or 30%, in fiscal year 2017 as compared to fiscal year 2016. The increase was primarily due to the addition of intangible assets associated with the technology obtained in connection with the acquisitions of DataRPM in the second quarter of fiscal year 2017 and Kinvey in the third quarter of fiscal year 2017, partially offset by the impairment of intangible assets associated with the technology obtained in connection with the acquisition of Modulus as well as the completion of amortization of certain intangible assets acquired in prior years. Our gross profit decreased $11.2 million, or 3%, in fiscal year 2017 as compared to fiscal year 2016, and our gross profit as a percentage of total revenue decreased from 84% to 83% compared to fiscal year 2016. The dollar decrease is primarily due to the decreases of license revenue and increases of amortization of acquired intangibles as described above. Sales and marketing expenses decreased $25.2 million, or 21%, in fiscal year 2017 as compared to fiscal year 2016, and decreased as a percentage of total revenue from 30% to 24%. The decrease in sales expenses was primarily due to lower compensation-related and travel costs as a result of the headcount reduction actions which occurred in the first quarter of fiscal year 2017, as well as a decrease in spending on marketing programs. Product development expenses decreased $11.6 million, or 13%, in fiscal year 2017 as compared to fiscal year 2016, and decreased as a percentage of revenue from 22% to 19%. The decrease in product development expense is primarily due to lower compensation-related costs as a result of the headcount reduction actions which occurred in the first quarter of fiscal year 2017. General and administrative expenses include the costs of our finance, human resources, legal, information systems and administrative departments. General and administrative expenses decreased $0.8 million, or 2%, in fiscal year 2017 as compared to fiscal year 2016, and increased as a percentage of revenue from 11% to 12%. The dollar decrease was primarily due to lower compensation-related costs as a result of the headcount reduction actions which occurred in the first quarter of fiscal year 2017. During fiscal year 2017, we tested goodwill for impairment for each of our reporting units as of October 31, 2017. Our reporting units each had fair values which significantly exceeded their carrying values as of the annual impairment date. As a result, we did not recognize any goodwill impairment charges during fiscal year 2017.
values as of the annual impairment date. Our Application Development and Deployment reporting unit did not pass the first step of the impairment test. As a result, we recorded a $92.0 million goodwill impairment charge related to the Application Development and Deployment reporting unit (see Note 6 to our Consolidated Financial Statements in Item 8 of this Form 10-K for further information on the impairment charge). Amortization of acquired intangibles included in operating expenses primarily represents the amortization of value assigned to intangible assets obtained in business combinations other than assets identified as purchased technology. Amortization of acquired intangibles increased slightly in fiscal year 2017 due to the addition of intangible assets obtained in connection with the acquisitions of DataRPM and Kinvey, which occurred in the second and third quarters of fiscal year 2017, respectively. During fiscal year 2017, we did not impair the value of any intangible assets. During fiscal year 2016, we evaluated the ongoing value of the intangible assets associated with the technology obtained in connection with the acquisition of Modulus. As a result of our decision to abandon the related assets due to a change in our expected ability to use the technology internally, we determined that the intangible assets were fully impaired. As a result, we incurred an impairment charge of $5.1 million during fiscal year 2016. See Note 6 to our Consolidated Financial Statements in Item 8 of this Form 10-K for additional details. In September 2017, Praesidium Investment Management, then one of our largest stockholders, publicly announced its disagreement with our strategy in a Schedule 13D filed with the SEC and stated that it was seeking changes in the composition of our Board of Directors. In fiscal year 2017, we incurred professional and other fees relating to Praesidium’s actions. We incurred restructuring expenses of $22.2 million in fiscal year 2017 as compared to $1.7 million in fiscal year 2016. Restructuring expenses recorded in fiscal year 2017 relate to the restructuring activities occurring in the first fiscal quarter of 2017. See Note 13 to our Consolidated Financial Statements in Item 8 of this Form 10-K for additional details, including types of expenses incurred and the timing of future expenses and cash payments. See also the Liquidity and Capital Resources section of this Item 7, Management’s Discussion and Analysis of Financial Condition and Results of Operations. Acquisition-related costs are expensed as incurred and include those costs incurred as a result of a business combination. These costs consist of professional services fees, including third-party legal and valuation-related fees, as well as retention fees, and earn-out payments treated as compensation expense. Acquisition-related expenses in fiscal year 2017 relate to the acquisitions of DataRPM and Kinvey, which occurred in the second and third quarters of fiscal year 2017, respectively. Acquisition-related expenses in fiscal year 2016 relate primarily to retention bonuses associated with our Telerik acquisition. See Note 7 to our Consolidated Financial Statements in Item 8 of this Form 10-K for additional details. Income from operations increased $100.3 million, or 338%, in fiscal year 2017 as compared to fiscal year 2016. As discussed above, the increase was primarily driven by the impairment of goodwill during fiscal year 2016 as well as the headcount reduction actions that began in the first quarter of fiscal year 2017. The increase was partially offset by the restructuring expenses recorded in fiscal year 2017 as well as the decreases of license revenue and increases of amortization of acquired intangibles as described above. Note that the following expenses are not allocated to our segments as we manage and report our business in these functional areas on a consolidated basis only: certain product development and corporate sales and marketing expenses, customer support, administration, amortization and impairment of acquired intangibles, impairment of goodwill, stock-based compensation, fees related to shareholder activist, restructuring, and acquisition-related expenses. Total other expense, net decreased $0.5 million in fiscal year 2017 as compared to fiscal year 2016 primarily due to a foreign currency loss of $1.3 million in fiscal year 2017 compared to a foreign currency loss of $2.2 million in fiscal year 2016. The change in foreign currency gains/losses is a result of movements in exchange rates and the impact during fiscal year 2017 on our intercompany receivables and payables denominated in currencies other than local currencies. Our effective income tax rate was 43% in fiscal year 2017 and (58)% in fiscal year 2016. In fiscal year 2016, our rate was impacted unfavorably as a result of the goodwill impairment expense that is not tax deductible, partially offset by a $2.7 million release of a valuation allowance on state research and development tax credits recorded in the fourth quarter of fiscal year 2016 and the out-of-period benefit described below. During the preparation of our consolidated financial statements for the three months ended May 31, 2016, we identified an error in our prior year income tax provision whereby income tax expense was overstated for the year ended November 30, 2015 by $2.7 million related to our tax treatment of an intercompany gain. We determined that the error is not material to the prior year financial statements. We also concluded that recording an out-of-period correction would not be material and corrected this error by recording an out-of-period $2.7 million tax benefit in our interim financial statements for the period ended May 31, 2016. The decrease in cash, cash equivalents and short-term investments of $44.1 million from the end of fiscal year 2017 was due to repurchases of common stock of $120.0 million, dividend payments of $25.8 million, the effect of exchange rates on cash of $10.5 million, equity grant withholding payments of $4.0 million, payments of capital expenditures of $7.3 million, and payments of debt obligations in the amount of $6.2 million. These cash outflows were partially offset by cash inflows from operations of $121.4 million and $9.2 million in cash received from the issuance of common stock. Except as described below, there are no limitations on our ability to access our cash, cash equivalents and short-term investments. Cash, cash equivalents and short-term investments held by our foreign subsidiaries was $35.6 million and $36.5 million at November 30, 2018 and 2017, respectively. Foreign cash includes unremitted foreign earnings, which are invested indefinitely outside of the U.S. As such, it is not available to fund our domestic operations. If we were to repatriate these earnings, we may be subject to income tax withholding in certain tax jurisdictions and a portion of the repatriated earnings may be subject to U.S. income tax. However, we do not anticipate that this would have a material adverse impact on our liquidity. In September 2017, our Board of Directors increased our total share repurchase authorization to $250.0 million. In fiscal years 2018 and 2017, we repurchased and retired 2.9 million shares of our common stock for $120.0 million and 2.2 million shares of our common stock for $73.9 million, respectively, under this current authorization. In fiscal year 2016, we repurchased and retired 3.1 million shares of our common stock for $79.2 million. As of November 30, 2018, there was $100.0 million remaining under the current authorization. We intend to repurchase $100 million in shares of our common stock in fiscal year 2019. However, the timing and amount of any shares repurchased will be determined by management based on its evaluation of market conditions and other factors, and we may choose to suspend, expand or discontinue the repurchase program at any time. During the fourth quarter of fiscal year 2016, our management approved, committed to and initiated plans to make strategic changes to our organization as a result of the appointment of our new Chief Executive Officer during the period. In connection with the new organizational structure, we eliminated the positions of Chief Product Officer and Chief Revenue Officer. As part of this fourth quarter restructuring, for the fiscal years ended November 30, 2018 and 2017, we did not incur any expenses and do not expect to incur additional material costs with respect to this restructuring. For the fiscal year ended November 30, 2016, we incurred expenses of $1.5 million. The expenses are recorded as restructuring expenses on the consolidated statements of operations. During the first quarter of fiscal year 2017, we announced certain operational restructuring initiatives intended to significantly reduce annual costs. As part of this action, management committed to a new strategic plan highlighted by a new product strategy and a streamlined operating approach. To execute these operational restructuring initiatives, we reduced our global workforce by over 20%. These workforce reductions occurred in substantially all functional units and across all geographies in which we then operated. During the fourth quarter of fiscal year 2017, we incurred additional costs with respect to this restructuring, including reduction in redundant positions primarily within the product development and sales functions. We also consolidated offices in various locations. As part of this fiscal year 2017 restructuring, for the fiscal years ended November 30, 2018 and 2017, we incurred expenses of $2.3 million and $22.1 million, respectively, which are recorded as restructuring expenses on the consolidated statements of operations. We do not expect to incur additional material costs with respect to this restructuring. Our credit agreement provides for a $123.8 million secured term loan and a $150.0 million secured revolving credit facility. The revolving credit facility may be made available in U.S. Dollars and certain other currencies and may be increased by up to an additional $125.0 million if the existing or additional lenders are willing to make such increased commitments. The revolving credit facility has sublimits for swing line loans up to $25.0 million and for the issuance of standby letters of credit in a face amount up to $25.0 million. We expect to use the revolving credit facility for general corporate purposes, including acquisitions of other businesses, and may also use it for working capital. The credit facility matures on November 20, 2022, when all amounts outstanding will be due and payable in full. The revolving credit facility does not require amortization of principal. The outstanding balance of the term loan as of November 30, 2018 was $117.6 million, with $6.2 million due in the next 12 months. The term loan requires repayment of principal at the end of each fiscal quarter, beginning with the fiscal quarter ended February 28, 2018. The principal repayment amounts are in accordance with the following schedule: (i) eight payments of $1.5 million each, (ii) four payments of $2.3 million each, (iii) four payments of $3.1 million each, (iv) three payments of $3.9 million each, and (v) the last payment is of the remaining principal amount. Any amounts outstanding under the term loan thereafter would be due on the maturity date. The term loan may be prepaid before maturity in whole or in part at our option without penalty or premium. As of November 30, 2018, the carrying value of the term loan approximates the fair value, based on Level 2 inputs (observable market prices in less than active markets), as the interest rate is variable over the selected interest period and is similar to current rates at which we can borrow funds. The average interest rate of the credit facility during the fiscal year ended November 30, 2018 was 3.43% and the interest rate as of November 30, 2018 was 3.81%. Revolving loans may be borrowed, repaid, and reborrowed until November 20, 2022, at which time all amounts outstanding must be repaid. As of November 30, 2018, there were no amounts outstanding under the revolving line and $1.3 million of letters of credit. The credit facility contains customary affirmative and negative covenants, including covenants that limit or restrict our ability to, among other things, grant liens, make investments, make acquisitions, incur indebtedness, merge or consolidate, dispose of assets, pay dividends or make distributions, repurchase stock, change the nature of the business, enter into certain transactions with affiliates and enter into burdensome agreements, in each case subject to customary exceptions for a credit facility of this size and type. We are also required to maintain compliance with a consolidated fixed charge coverage ratio, a consolidated total leverage ratio and a consolidated senior secured leverage ratio. We are in compliance with these financial covenants as of November 30, 2018. The increase in cash generated from operations in fiscal year 2018 as compared to fiscal year 2017 was primarily due to higher operating income, partially offset by a year over year difference in changes in operating assets and liabilities. The most significant non-cash reconciling item included in net income in fiscal year 2018 was a $5.1 million loss on assets held for sale (see Note 5 to the Consolidated Financial Statements in Item 8 of this Form 10-K for further information on the impairment charge). The significant changes in operating assets and liabilities in fiscal year 2018 as compared to fiscal year 2017 were primarily due to a decrease in personnel related expenditures. Also, our total deferred revenue as of November 30, 2018 increased by $6.0 million from the end of fiscal year 2017 resulting from an increase in deferred license and maintenance revenue in our OpenEdge segment and Telerik multi-year maintenance renewals. In addition, our gross accounts receivable as of November 30, 2018 decreased by $2.7 million from the end of fiscal year 2017. Days sales outstanding ("DSO") in accounts receivable was 47 days at the end of fiscal year 2018 and fiscal year 2017. The increase in cash generated from operations in fiscal year 2017 compared to fiscal year 2016 was primarily due to the year-over-year difference in changes in non-cash reconciling items included in net income (loss) and higher operating income. The most significant non-cash reconciling items included in net income (loss) in fiscal year 2016 include a $92.0 million impairment charge related to the goodwill of the Application Development and Deployment reporting unit and a $5.1 million impairment charge related to intangible assets obtained in connection with the acquisition of Modulus (see Note 6 to the Consolidated Financial Statements in Item 8 of this Form 10-K for further information on the impairment charges). We did not record any impairment charges in fiscal year 2017. Net cash outflows and inflows of our net investment activity are generally a result of the timing of our purchases and maturities of securities, which are classified as cash equivalents or short-term securities, as well as the timing of acquisitions and divestitures. Most significantly, we did not complete any acquisitions during fiscal year 2018, whereas we acquired DataRPM and Kinvey for a net cash amount of $77.2 million in fiscal year 2017. In addition, we purchased $7.3 million of property and equipment in fiscal year 2018, as compared to $3.4 million in fiscal year 2017. Cash used in investing increased in fiscal year 2017 as compared to fiscal year 2016. The increase was primarily a result of the timing of acquisitions and divestitures. In fiscal year 2017, we acquired DataRPM and Kinvey for a net cash amount of $77.2 million, whereas we did not complete any acquisitions during fiscal year 2016. In addition, we spent $3.4 million on property and equipment and capitalized software costs in fiscal year 2017 as compared to $5.8 million in fiscal year 2016. During fiscal year 2018, we received $9.2 million from the exercise of stock options and the issuance of shares under our employee stock purchase plan as compared to $10.0 million in fiscal year 2017 and $9.9 million in fiscal year 2016. In addition, we made dividend payments of $25.8 million to our stockholders in fiscal year 2018, as compared to payments of $24.1 million in fiscal year 2017. Most significantly, we repurchased $120.0 million of our common stock under our share repurchase plan, compared to $73.9 million in fiscal year 2017 and $79.2 million in fiscal year 2016. We also made principal payments on our debt of $6.2 million during fiscal year 2018, as compared to $12.4 million in fiscal year 2017 and $9.4 million in fiscal year 2016. We include standard intellectual property indemnification provisions in our licensing agreements in the ordinary course of business. Pursuant to our product license agreements, we will indemnify, hold harmless, and agree to reimburse the indemnified party for losses suffered or incurred by the indemnified party, generally business partners or customers, in connection with certain patent, copyright or other intellectual property infringement claims by third parties with respect to our products. Other agreements with our customers provide indemnification for claims relating to property damage or personal injury resulting from the performance of services by us or our subcontractors. Historically, our costs to defend lawsuits or settle claims relating to such indemnity agreements have been insignificant. Accordingly, the estimated fair value of these indemnification provisions is immaterial. We believe that existing cash balances, together with funds generated from operations and amounts available under our credit facility, will be sufficient to finance our operations and meet our foreseeable cash requirements through at least the next twelve months. We do not contemplate a need for any foreign repatriation of the earnings which are deemed invested indefinitely outside of the U.S. Our foreseeable cash needs include our planned capital expenditures, debt repayments, quarterly cash dividends, share repurchases, acquisitions, lease commitments, restructuring obligations and other long-term obligations. Our backlog of orders not included on the balance sheet is not subject to our normal accounting controls for information that is either reported in or derived from our basic financial statements. Note that approximately $0.5 million and $14.8 million of the multi-year licensing arrangements as of November 30, 2018 and November 30, 2017, respectively, relate to OEM arrangements in our Data Connectivity and Integration business segment, while the remaining amount relates to arrangements in our OpenEdge business segment. We typically fulfill most of our software license orders within 30 days of acceptance of a purchase order. Assuming all other revenue recognition criteria have been met, we recognize software license revenue upon shipment of the product, or if delivered electronically, when the customer has the right to access the software. Because there are many elements governing when revenue is recognized, including when orders are shipped, credit approval obtained, completion of internal control processes over revenue recognition and other factors, management has some control in determining the period in which certain revenue is recognized. In addition, there is no industry standard for the definition of backlog and there may be an element of estimation in determining the amount. As such, direct comparisons with other companies may be difficult or potentially misleading. We have no off-balance sheet arrangements as defined in Item 303(a)(4) of Regulation S-K.
Interest on the long-term debt is due and payable monthly and is estimated using the effective interest rate as of November 30, 2018 as the interest rate is variable. See Note 8 to our Consolidated Financial Statements in Item 8 of this Form 10-K for additional information. Represents the fixed or minimum amounts due under purchase obligations for support service agreements. Our other noncurrent liabilities on the consolidated balance sheet include unrecognized tax benefits and related interest and penalties. As of November 30, 2018, we had unrecognized tax benefits of $3.6 million and an additional $0.4 million for interest and penalties classified as noncurrent liabilities. At this time, we are unable to make a reasonably reliable estimate of the timing of payments in individual years in connection with these tax liabilities; therefore, such amounts are not included in the above contractual obligation table. See Note 14 to our Consolidated Financial Statements in Item 8 of this Form 10-K for additional information. Management’s discussion and analysis of financial condition and results of operations are based upon our consolidated financial statements which have been prepared in accordance with GAAP. We make estimates and assumptions in the preparation of our consolidated financial statements that affect the reported amounts of assets and liabilities, revenue and expenses and related disclosures of contingent assets and liabilities. We base our estimates on historical experience and various other assumptions that are believed to be reasonable under the circumstances. However, actual results may differ from these estimates. We have identified the following critical accounting policies that require the use of significant judgments and estimates in the preparation of our consolidated financial statements. This listing is not a comprehensive list of all of our accounting policies. For further information regarding the application of these and other accounting policies, see Note 1 to our Consolidated Financial Statements in Item 8 of this Form 10-K.
We derive our revenue primarily from software licenses and maintenance and services. Our license arrangements generally contain multiple elements, including software maintenance services, consulting services, and customer education services. We do not recognize revenue until the following four basic criteria are met: (i) persuasive evidence of an arrangement exists, (ii) our product has been shipped or, if delivered electronically, the customer has the right to access the software, (iii) the fee is fixed or determinable, and (iv) collection of the fee is probable. Evidence of an arrangement generally consists of a contract or purchase order signed by the customer. In regard to delivery, we generally ship our software electronically and do not license our software with conditions of acceptance. If an arrangement does contain conditions of acceptance, we defer recognition of the revenue until the acceptance criteria are met or the period of acceptance has passed. Services are considered delivered as the work is performed or, in the case of maintenance, over the contractual service period. We assess whether a fee is fixed or determinable at the outset of the arrangement and consider the payment terms of the transaction, including transactions that extend beyond our customary payment terms. We do not license our software with a right of return. In assessing whether the collection of the fee is probable, we consider customer credit-worthiness, a customer’s historical payment experience, economic conditions in the customer’s industry and geographic location and general economic conditions. If we do not consider collection of a fee to be probable, we defer the revenue until the fees are collected, provided all other conditions for revenue recognition have been met. In determining when to recognize revenue from a customer arrangement, we are often required to exercise judgment regarding the application of our accounting policies to a particular arrangement. The primary judgments used in evaluating revenue recognized in each period involve: determining whether collection is probable, assessing whether the fee is fixed or determinable, and determining the fair value of the maintenance and services elements included in multiple-element software arrangements. Such judgments can materially impact the amount of revenue that we record in a given period. While we follow specific and detailed rules and guidelines related to revenue recognition, we make and use significant management judgments and estimates in connection with the revenue recognized in any reporting period, particularly in the areas described above. If management made different estimates or judgments, material differences in the timing of the recognition of revenue could occur. In regard to software license revenues, perpetual and term license fees are recognized as revenue when the software is delivered, no significant obligations or contingencies related to the software exist, other than maintenance, and all other revenue recognition criteria are met. We generally recognize revenue for products distributed through application partners and distributors on a sell-in basis. Revenue from maintenance is recognized ratably over the service period. Maintenance revenue is deferred until the associated license is delivered to the customer and all other criteria for revenue recognition have been met. Revenue from other services, which are primarily consulting and customer education services, is generally recognized as the services are delivered to the customer, provided all other criteria for revenue recognition have been met. We also offer products via a software-as-a-service ("SaaS") model, which is a subscription based model. Subscription revenue derived from these agreements is generally recognized on a straight-line basis over the subscription term, provided persuasive evidence of an arrangement exists, access to our software has been granted to the customer, the fee for the subscription is fixed or determinable, and collection of the subscription fee is probable. We generally sell our software licenses with maintenance services and, in some cases, also with consulting services. For these multiple element arrangements, we allocate revenue to the delivered elements of the arrangement using the residual method, whereby revenue is allocated to the undelivered elements based on vendor specific objective evidence ("VSOE") of fair value of the undelivered elements with the remaining arrangement fee allocated to the delivered elements and recognized as revenue assuming all other revenue recognition criteria are met. For the undelivered elements, we determine VSOE of fair value to be the price charged when the undelivered element is sold separately. We determine VSOE for maintenance sold in connection with a software license based on the amount that will be separately charged for the maintenance renewal period. Substantially all license arrangements indicate the renewal rate for which customers may, at their option, renew their maintenance agreement. We determine VSOE for consulting services by reference to the amount charged for similar engagements when a software license sale is not involved. We review services sold separately on a periodic basis and update, when appropriate, our VSOE of fair value for such maintenance and services to ensure that it reflects our recent pricing experience. If VSOE of fair value for the undelivered elements cannot be established, we defer all revenue from the arrangement until the earlier of the point at which such sufficient VSOE does exist or all elements of the arrangement have been delivered, or if the only undelivered element is maintenance, then we recognize the entire fee ratably over the maintenance period. If payment of the software license fees is dependent upon the performance of consulting services or the consulting services are essential to the functionality of the licensed software, then we recognize both the software license and consulting fees using the completed contract method. Sales taxes collected from customers and remitted to government authorities are excluded from revenue. Deferred revenue generally results from contractual billings for which revenue has not been recognized and consists of the unearned portion of license, maintenance, and services fees. Deferred revenue expected to be recognized as revenue more than one year subsequent to the balance sheet date is included in long-term liabilities in the consolidated balance sheets. We had goodwill and net intangible assets of $373.9 million at November 30, 2018. We evaluate goodwill and other intangible assets with indefinite useful lives, if any, for impairment annually or on an interim basis when events and circumstances arise that indicate impairment may have occurred. We perform our annual goodwill impairment as of October 31st of each fiscal year. We believe this date aligns the timing of the annual goodwill impairment testing with our planning and budgeting process, which is a key component of the tests, and alleviates administrative burden during our year-end reporting period. quantitative impairment test of goodwill, we compare the fair value of a reporting unit to its carrying value. If the reporting unit’s carrying value exceeds its fair value, we record an impairment loss to the extent that the carrying value of goodwill exceeds its implied fair value. We estimate the fair values of our reporting units using discounted cash flow models or other valuation models, such as comparative transactions and market multiples. We must make assumptions about future cash flows, future operating plans, discount rates, comparable companies, market multiples, purchase price premiums and other factors in those models. Different assumptions and judgment determinations could yield different conclusions that would result in an impairment charge to income in the period that such change or determination was made. When we evaluate potential impairments outside of our annual measurement date, judgment is required in determining whether an event has occurred that may impair the value of goodwill or intangible assets. Factors that could indicate that an impairment may exist include significant underperformance relative to plan or long-term projections, significant changes in business strategy, significant negative industry or economic trends or a significant decline in our stock price for a sustained period of time. The determination of reporting units also requires management judgment. We consider whether a reporting unit exists within a reportable segment based on the availability of discrete financial information that is regularly reviewed by segment management. Our three reporting units were OpenEdge, Data Connectivity and Integration, and Application Development and Deployment as of November 30, 2018. During fiscal year 2018, we tested goodwill for impairment for each of our reporting units as of October 31, 2018. Our reporting units each had fair values which significantly exceeded their carrying values as of the annual impairment date. We did not recognize any goodwill impairment charges during fiscal years 2018 or 2017. During fiscal year 2016, we tested goodwill for impairment for each of our reporting units as of October 31, 2016. Our OpenEdge and Data Connectivity and Integration reporting units had fair values which significantly exceeded their carrying values as of the annual impairment date. Our Application Development and Deployment reporting unit (which includes Telerik) did not pass the first step of the impairment test. As a result, we recorded a $92.0 million goodwill impairment charge related to the Application Development and Deployment reporting unit (see Note 6 to our Consolidated Financial Statements in Item 8 of this Form 10-K for further information on the impairment charge). We have a net deferred tax liability of $1.9 million at November 30, 2018. We record valuation allowances to reduce deferred tax assets to the amount that is more likely than not to be realized. We consider scheduled reversals of temporary differences, projected future taxable income, tax planning strategies and other matters in assessing the need for and the amount of a valuation allowance. If we were to change our assumptions or otherwise determine that we were unable to realize all or part of our net deferred tax asset in the future, an adjustment to the deferred tax asset would be charged to income in the period that such change or determination was made. Management judgment is also required in evaluating whether a tax position taken or expected to be taken in a tax return, based on the weight of available evidence, indicates that it is more likely than not that, on an evaluation of the technical merits, the tax position will be sustained on audit, including resolution of any related appeals or litigation processes. Management judgment is also required in measuring the tax benefit as the largest amount that is more than 50% likely of being realized upon ultimate settlement. If management made different estimates or judgments, material differences in the amount accrued for uncertain tax positions would occur. We recognize stock-based compensation based on the fair value of stock-based awards, less the present value of expected dividends, measured at the date of grant. Stock-based compensation is recognized over the requisite service period, which is generally the vesting period of the award, and is adjusted each period for actual forfeitures. expected option term at the time of grant. The expected dividend yield is based on our historical behavior and future expectations of dividend declarations. We periodically record restructuring charges resulting from restructuring our operations (including consolidations and/or relocations of operations), changes to our strategic plan, or managerial responses to declines in demand, increasing costs, or other market factors. The determination of restructuring charges requires management judgment and may include costs related to employee benefits, such as costs of severance and termination benefits, and estimates of costs for future lease commitments on excess facilities, net of estimated future sublease income. In determining the amount of the facilities charge, we are required to estimate such factors as future vacancy rates, the time required to sublet properties and sublease rates. These estimates are reviewed quarterly based on known real estate market conditions and the credit-worthiness of subtenants, and may result in revisions to established facility reserves. We allocate the purchase price of acquired companies to the tangible and intangible assets acquired and liabilities assumed based on their estimated fair values. The estimates used to value the net assets acquired are based in part on historical experience and information obtained from the management of the acquired company. We generally value the identifiable intangible assets acquired using a discounted cash flow model. The significant estimates used in valuing certain of the intangible assets include, but are not limited to: future expected cash flows of the asset, discount rates to determine the present value of the future cash flows, attrition rates of customers, and expected technology life cycles. We also estimate the useful lives of the intangible assets based on the expected period over which we anticipate generating economic benefit from the asset. Our estimates of fair value are based on assumptions believed to be reasonable at that time. If management made different estimates or judgments, material differences in the fair values of the net assets acquired may result. Refer to Note 1 to our Consolidated Financial Statements in Item 8 of this Form 10-K.
We are exposed to a variety of risks, including changes in interest rates affecting the return on our investments and foreign currency fluctuations. We have established policies and procedures to manage our exposure to fluctuations in interest rates and foreign currency exchange rates. Exposure to market rate risk for changes in interest rates relates to our investment portfolio. We have not used derivative financial instruments in our investment portfolio. We place our investments with high-quality issuers and have policies limiting, among other things, the amount of credit exposure to any one issuer. We seek to limit default risk by purchasing only investment-grade securities. Our investments have an average remaining maturity of less than two years or interest-rate resets of less than 60 days and are primarily fixed-rate instruments. In addition, we have classified our debt securities as available-for-sale. The available-for-sale classification reduces the consolidated statements of operations exposure to interest rate risk if such investments are held until their maturity date because changes in fair value due to market changes in interest rates are recorded on the consolidated balance sheet in accumulated other comprehensive income. Based on a hypothetical 10% adverse movement in interest rates, the potential losses in future earnings, fair value of risk-sensitive instruments and cash flows are immaterial. We generally use forward contracts that are not designated as hedging instruments to hedge economically the impact of the variability in exchange rates on intercompany accounts receivable and loans receivable denominated in certain foreign currencies. We generally do not hedge the net assets of our international subsidiaries. All forward contracts are recorded at fair value in other current assets, other assets, other accrued liabilities, or other noncurrent liabilities on the consolidated balance sheets at the end of each reporting period and expire between 30 days and 366 days from the date the contract was entered. In fiscal year 2018, realized and unrealized losses of $6.9 million from our forward contracts were recognized in foreign currency loss, net on the consolidated statements of operations. These losses were substantially offset by realized and unrealized gains and losses on the offsetting positions. revenue would be adversely affected by approximately 3%, or $13 million, and our net income would be adversely affected by approximately 5%, or $3 million (excluding any offsetting positive impact from our ongoing hedging programs), although the actual effects may differ materially from the hypothetical analysis. We have audited the accompanying consolidated balance sheets of Progress Software Corporation and subsidiaries (the "Company") as of November 30, 2018 and 2017, and the related consolidated statements of operations, comprehensive income (loss), shareholders' equity, and cash flows for each of the three years in the period ended November 30, 2018, and the related notes (collectively referred to as the “financial statements”). In our opinion, the financial statements present fairly, in all material respects, the financial position of the Company as of November 30, 2018 and 2017, and the results of its operations and its cash flows for each of the three years in the period ended November 30, 2018, in conformity with accounting principles generally accepted in the United States of America. We have also audited, in accordance with the standards of the Public Company Accounting Oversight Board (United States) (PCAOB), the Company's internal control over financial reporting as of November 30, 2018, based on the criteria established in Internal Control - Integrated Framework (2013) issued by the Committee of Sponsoring Organizations of the Treadway Commission and our report dated January 28, 2019 expressed an unqualified opinion on the Company's internal control over financial reporting. We have served as the Company's auditor since 1990.